“There used to be a lot more signalized intersections that were actually removed to expedite the speed of traffic in the 1960s, now [we’re] trying to slow them down,” said Sam Goodman, a lifelong resident of the Grand Concourse who works as the transportation planner in the office of the Bronx borough president. Goodman was one of two dozen Bronxites who came to a DOT workshop last night to talk about what they want from the next phase of the Grand Concourse’s reconstruction, which will extend 1.3 miles from 175th Street to Fordham Road. People at last night’s workshop identified many challenges they face biking and walking along the Concourse. The bike lane, which runs next to the parking lane on service roads, is frequently blocked by double-parked vehicles. Long crossing distances are compounded by intersections with irregular angles that confuse pedestrians and motorists alike. Protected bike lanes, bus lanes on the central roadway, mid-block signalized crossings, simplified intersections, and raised medians were all suggested as solutions. Jordan Laks, who until last year taught at a middle school in the neighborhood, said he had students who were hit and seriously injured trying to cross the Concourse. “They know [the street is dangerous], but unfortunately they’re also kids,” he said. There are more traffic injuries and deaths on the Grand Concourse than any other street in the Bronx. Since 2013, crashes on the Concourse have injured more than 1,000 people and killed 13, according to city data. To end the carnage, Transportation Alternatives has called on the city to install protected bike lanes, dedicated bus lanes, and pedestrian safety improvements along the entire length of the street, via its “Complete the Concourse” campaign. With 3,000 signatures, T.A.’s campaign has won the support of five of the six council members who represent the Concourse, as well as Bronx Community Board 4. 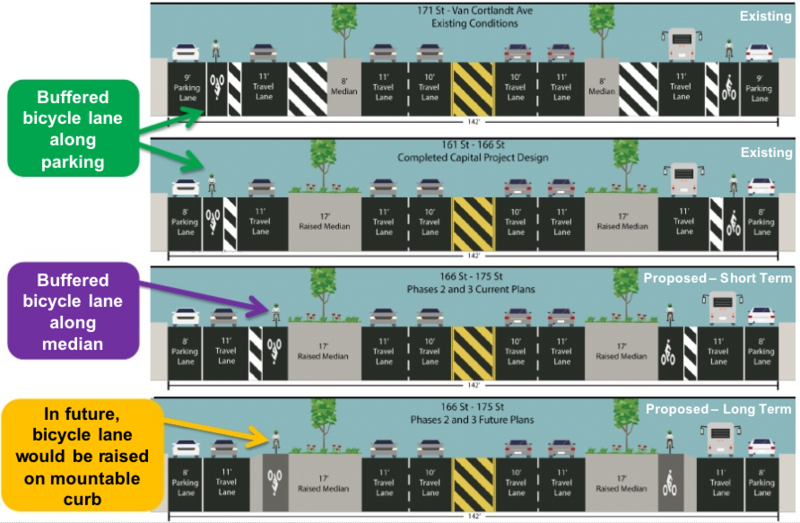 The sixth council member, Speaker Melissa Mark-Viverito, has called on DOT to study protected bike lanes for the segment south of 158th Street, the part of the Concourse that she represents. Last year, DOT implemented a package of safety fixes south of 158th Street that did not include any bike lanes. North of 161st Street, there are currently buffered bike lanes next to curbside parking on the Concourse’s service roads. The first phase of the Grand Concourse reconstruction, between 161st Street and 166th Street, wrapped up in 2008 without any bike lane upgrades. DOT plans to realign the bike lane along the median for the second phase, between 166th and 171st, and the third phase, which extends to 175th Street. At first the bike lane will be realigned simply by restriping it on the other side of the street. While DOT has used flexible posts to separate a similar bike lane from traffic on Queens Boulevard, DOT said the bike lane on the Grand Concourse won’t get that treatment, because it’s not wide enough for street-cleaning vehicles to fit. Representatives from DOT and DDC will come to Bronx CB 5 in the summer or early fall with a final design for phase four. After that, DOT will build out the low-cost version. Then local residents may have a long wait ahead of them before the full reconstruction extends above 171st Street. The design for phase three is currently receiving bids from contractors and, given DDC’s track record, may not break ground for a few more years. Phase four would not break ground until phase three is completed, likely in the 2020s. Is there some reason this proposal stops at 175th? 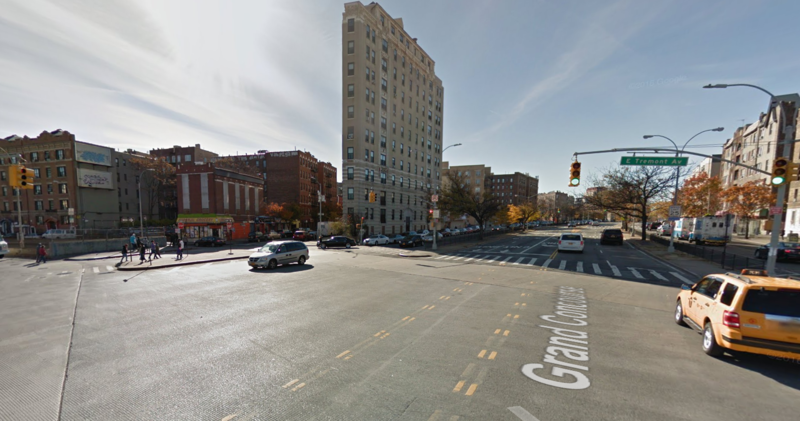 Grand Concourse extends past 206th Street. Could be a great cycling route if it weren’t usually Days of Thunder. If a bike path went all the way past 206th, it could connect to the Mosholu Parkway Greenway, which would give cyclists a route north-to-south as well as east-to-west in the Bronx. 5-6 foot bike lanes are ideal. We wouldn’t want them getting any ideas about riding side by side or passing. The Mosholu isn’t very useful for people getting into Manhattan, it goes the wrong way. Webster Ave north of Fordham Rd. is excellent for biking, as is the Bronx River Parkway. No flex posts = useless bike lane. People will drive in it. The city needs to stop designing infrastructure around existing trucks… It should be the other way around. Community board division. There are future phases planned. Expect at least two more. I participated in this session; hopefully DOT revises their plans to include protected bike lanes and dedicated bus lanes as both are sorely needed! What justification is there for the 12′ median in a four lane city street? Re:smaller sweepers. They already have some. Just saw a mini Zamboni cleaning the Hudson Greenway last week. Pretty cool and effective. This pretty much sums up cycling in NYC. Or riding faster than 6mph! The Bx1/2 is the second busiest bus route in the Bronx, despite being directly on top of a subway. Any redesign MUST include a bus lane, especially given the MTA’s extreme costs and glacial pace on adding elevators to B/D stations. The service roads should be dedicated to buses. Let the personally owned automobiles operate and park within the centerline.